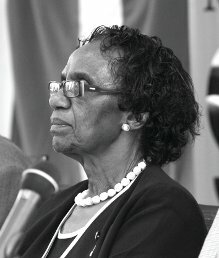 November 19, 2010 – On behalf of our Founder, Chairperson, Board of Trustees and staff we express our sadness at the passing of MaBertha Gxowa and would like to offer our deepest condolences to her family and friends. MaBertha Gxowa (nee Mashaba) a veteran anti-apartheid activist and stalwart for a non-racial, non-sexist democratic South Africa, passed away today in a Johannesburg hospital at the age of 75. As a young woman MaBertha was active in the ANC Youth League, the ANC Women’s League and, after our first democratic elections in 1994, started her long service as an ANC Member of Parliament. 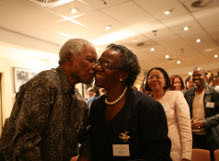 She joined the 1952 Campaign for the Defiance of Unjust Laws (Defiance Campaign) led by Volunteer-in-Chief Nelson Mandela. She was an organiser of the 1956 Women’s March on the Union Buildings against the extension of passes to women and was chosen as an alternate leader should one of the main leaders be arrested. MaBertha was also one of 156 accused in the historic 1956 Treason Trial. She remained on trial until the charges against her were dropped in 1959. She was arrested in the 1960 state of emergency and then banned under the Suppression of Communism Act. After the ANC was legalised in 1990, she threw herself back into working for the organisation. MaBertha amused the audience of invited guests by recalling an incident in which Helen Joseph, refused to divulge her age in her testimony. “I remember Helen got on the dock and listed her accomplishments. The prosecutor then asked her, ‘You say you have done all this, a social worker and a welfare officer. May I just ask, how old are you?’ and Helen refused to answer. She said, ‘What does my age have to do with this trial?’ She refused to answer until the court had to adjourn and the accused were asking her to just reveal her age. She said, ‘This case can go on for 10 more years, I will not reveal my age,’” MaBertha laughed. South Africa has lost one of our most committed activists.